Reading, Wri ting and Arithmetic … always has been and always will be at the foundation of learning. In the 21st Century we must also be S.T.E.M. Scholars. If we are not, our probability of success in our daily lives and the job market will also present diminishing returns at an exponential level. 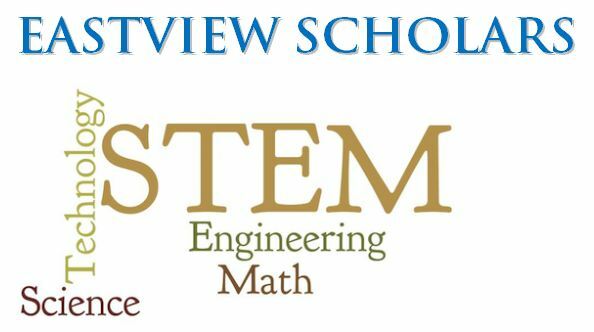 Select this link for Eastview STEM Scholar Certificate Programming and Scholarship Options : STEM Honors College Prep, STEM 4 Year College Prep, STEM Pathways to Engineering & Medical Careers. Our multi-dimensional STEM program includes a powerful comprehensive academic core, with a four-year engineering sequence which culminates with the College Prep Engineering experience. At Eastview, many of our top STEM Scholars are also our finest musicians, writers, actors and artists. T he deep comprehensive engagement in the humanities, the arts as well as STEM, develops a student who is well prepared for the 21st Century. In addition, the importance of the 21st Century skills which are prominent in our creative right brained thinkers, is well established in academic and workforce readiness research. Daniel Pink’s 2006 book, “A Whole New Mind”, and his 2011 book, “Drive”, communicates the power of collaboration, innovation, problem-solving, creativity, leadership, teamwork and critical thinking; these ancillary academic skills though prominent work place skills, are developed significantly through the academic process at Eastview High School. * 63% of those with only an associate’s degrees in STEM earn more that those with a bachelor’s degree in non-STEM occupations. * 47% of those with bachelor’s degrees in STEM occupations earn more than Ph.D.s in non-STEM occupations. As educators and parents we cannot accept the common adage, “I’m just not a math… an analytical… or a science person.” No, there is not an expectation that ALL students will be engineers, chemists, physicists or physicians, though to thrive and succeed as an individual and as a society, analytical adept citizens are essential for our personal productivity and the success of our nation. IN THE OUR CURRENT ECONOMY AND WORLD OF WORK… What we should be concerned about, in the words of Anthony Carnevale, director of the Georgetown University Center on Education and the Workforce, is the “misalignment between our education system and the labor market.” The latter, he notes, “is demanding much more specific preparation” than students get. One word: Engineering. While petroleum engineers can start above $90,000, in other fields beginning pay is in the $50,000-$70,000 range. 24/7 Learning Progress, Planning and Outcome Updates: There’s an App For That!